A personal friend of mine…an attorney, told me that he contracted with a search engine optimization company, (let’s call them the “Mellow” Pages) because they claimed to specialize in search engine optimization for personal injury attorneys. 6 thousand dollars later he was asking me why he was getting top rankings on the search results pages, but no additional business. It didn’t take a forensic pathologist to unravel this mystery. After reviewing the keyword phrases that he contracted for verses the actual results, it was evident that he was simply the victim of a classic bait and switch. Let me emphasize that my attorney friend…a VERY intelligent guy and a top attorney had absolutely no reason to suspect what would be painfully obvious to an Internet Marketing specialist. He is a very competent attorney…not a digital marketing professional. Did you notice the difference? Simply by adding one more word (California) to an otherwise legitimate long tail keyword phrase, it turned a very competitive, highly searched on phrase into something easily achievable, but with no discernable ROI. Notice that virtually each phrase with the word “California” at the end of it ranks higher than the same phrase without the State name. Why is that? Well, by simply searching on both phrases in Google and comparing the amount of search results, I could quickly see that the phrase “car accident attorney irvine California” was approximately 370% less competitive than the version without the word “California” tagged onto the end. Is that a good thing? Actually your SEO consultant should be looking for less competitive words; that is an essential ingredient to good keyword selection. However those less competitive phrases must also represent a fair amount of searches. At the end of the day I would rather show up for 20% of a thousand searches than zero percent of a Million searches. If the research showed that by adding the State name at the end of all those phrases resulted in reduced, but significant traffic, then it would have been a sound strategy. In this case people who live in Irvine rarely search on a phrase like “car accident lawyer Irvine California”, however they do search on a phrase like “car accident lawyer Irvine”. The “Mellow” pages simply made it easy on themselves at the expense of their client. Let’s put this into perspective; every successful business person is good at what they do. There is no reason for anyone to be good in an entirely different industry like digital marketing. I would never review my own contracts, or do my own accounting. 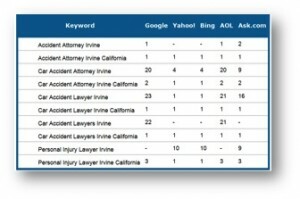 Why would I expect a lawyer to be able to interpret the results of a search engine optimization campaign? So how do you safeguard against unscrupulous Internet marketing practitioners? The same way you would when referencing any company or individual; “Reputation Management”. My best advice is to simply search on: “reviews” + “the individual you are working with” to see what other folks have to say about their experience with that SEO specialist you are considering. Remember, ethics and skill are mutually exclusive. My instincts tell me that the “Mellow” Pages should have been more trustworthy and accountable, but that was clearly not the case.